Audio Link: Jonathan Mosen introduces and demonstrates the ElBraille 14. The ElBraille is a portable device designed for users who are blind or deaf-blind and want to stay connected at school, work, or home as well as on the go. The twenty-first century, take anywhere replacement for the dedicated notetaker, ElBraille combines the power and flexibility of a modern mainstream computer running the Windows® 10 operating system with JAWS® and a Braille display with a full Braille keyboard to offer a fully accessible compact computer. JAWS provides the best screen reader experience with either Eloquence speech output or the highly responsive and life-like Vocalizer Expressive Compact voices as well as full Braille output. Type text into documents or perform JAWS and Windows® commands right from the Braille display’s keyboard using the JAWS BrailleIn® feature. Run any Windows application such as Microsoft Word®, Excel®, PowerPoint®, or Outlook®. Use FSReader to read DAISY books from sources such as Bookshare.org or browse the internet with Microsoft Internet Explorer® or Mozilla® Firefox. ElBraille also includes a set of specially designed apps for performing popular actions such as the creation of voice or text notes, listening to audio content, and more. 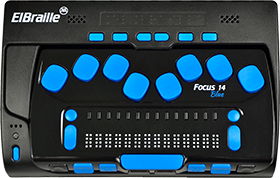 Save by upgrading your current investment – Compatible with your existing Focus 14 Blue or Focus 40 Blue Braille Display and your existing JAWS license.